I haven’t blogged for months. I don’t know if anyone reads my blogs but if there is even just one person who is waiting for me to write one then I am sorry for not writing one sooner. This winter besides getting both of my hips replaced I started the graphic design program at SBCC. I have always been terrified of anything mechanical including computers. Managing a plug was a big deal. I have to admit I thought that my teacher was way too tough when I started the program. “Be kinder, be more understanding,”,I thought to myself. Well, about a third of the class dropped out and the rest of the students dedicated themselves to learning the technical training necessary to use adobe programs. Ugh, it was so hard for me..but I learned a lot! My teacher was amazing! I just finished my final exam and I turned in my final project, a process book that I ended up feeling really proud of. 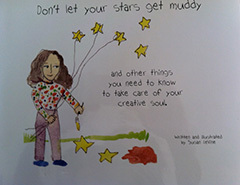 I made a book called Don’t let your stars get muddy and other things you need to know to take care of your creative soul. I published it and it will soon be available for anyone who wants it! Sometimes the hardest things that you make yourself do can change your reality and make your life better and can give you more tools to create and live the life that you want and live it powerfully or at least with more skills! I hope that anyone who reads this take the leap. Make steps to be more of who you wish to be. Clearly I need to learn how to take better pictures. I will download a better picture soon.